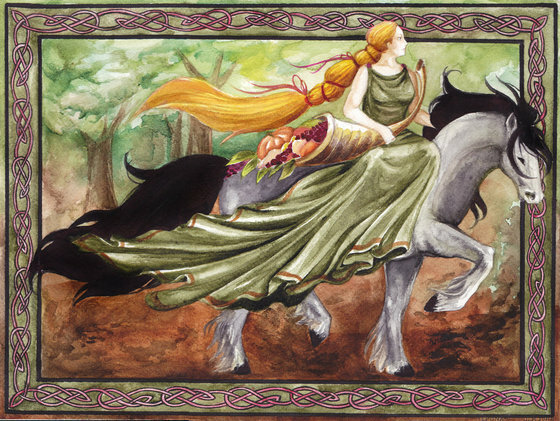 Epona is one of the most well-known of all the Goddesses within the Celtic Pantheon, and was granted such titles as "The Great Mare," the "Divine Mare," and the "Mare Goddess.” Her name derives from the Celtic words “epos” meaning “horse” and the suffix “-ona” meaning “on. Her worship began in Gaul (Celtic France) and spread to Britain and Rome. She was especially revered by those whose job or livelihood depended on horses. Epona was also a Goddess of fertility, and is often shown with a cornucopia, ears of grain and the presence of foals in sculptures. Epona is also depicted with keys, which together with Her horses as messengers, link Her to the Underworld and the dream world. She was beloved of Roman soldiers who encountered Her in Gaul and brought Her to Rome where She was enshrined and given Her own feast day. The Roman Calvary adopted Her as their guardian Goddess and the Roman legions carried Her worship throughout the Roman Empire from Britain to as far away as North Africa. Epona was worshipped in domestic and workplace shrines as well as special shrines that were set up in stables to protect the horses that lived there. In Great Britain, the traditional hobby-horse riders parading on May Day at Padstow, Cornwall and Minehead, Somerset may have deep roots in the veneration of Epona, as may the British aversion to eating horsemeat. Though some people believe that the Uffington White Horse, created around 1400 BCE that is carved into the chalk hill in Southern England is directly associated with Epona, it was created before Epona came to the British Isles. Call on Epona for protection (especially for animals), for fertility of body, mind, and spirit, and for dreams to guide you on your life path. ICONOGRAPHY: There are several hundred statues, statuettes, bas-reliefs and painted depictions of Epona. She has been depicted riding side-saddle, or upon a mare accompanied by a suckling or sleeping foal, or standing between two or four horses or shown as a tamer of horses. ATTRIBUTES: A key, cornucopia, basket of fruit, the cloth once traditionally used to start horse races. SACRED to EPONA: Horses, dogs, birds, geese and ravens. Roses, apples, carrots and oats. Her shrines were often decorated with garlands of roses.